"A classic Russian stage play that fails to soar"
'Love, friendship and respect do not unite people as much as a common hatred for something.' Anton Chekhov The best way to describe Russian comedy is to take a story of misplaced love, wasted lives and the ever-present potential of suicide wrapped in a splendidly ironic purple bow. Anton Chekhov’s celebrated comedic stage production plays against the beautiful Russian landscape, but the disquieting frustration is how the cast is only able to look in upon their own selfish and depressing desires. Then to perpetuate this discontent with a primarily American cast that makes no attempt to be Russian despite being staged in Russia, director Michael Mayer has a daunting task to allow this dark comedy to soar to new heights. Chekhov writes his multi-faceted tale in the countryside outside of Moscow in the home of Pjotr Nikolayevich Sorin (Brian Dennehy) who welcomes his sister, the renowned actress Arkadina (Annette Benning) to stay during the summer. During one of the evening festivities, her son Konstantin (Billy Howle) prepares his recent play for its official reveal to the family and their guests which includes the celebrated author, Boris Trigorin (Corey Stoll). A special element of the performance is the young playwright's inclusion of his true love, Nina (Saoirse Ronan), as the lead, but things go very wrong on the night and the production finishes abruptly. In amongst the frustration of the disaster of his play, Konstantin becomes unhinged and becomes filled with jealousy toward Boris, because of his fame and his interest in Nina. As the heat and tensions rise in the country estate, Arkadina decides to take her lover away from the temptation of the innocent country girl who is enamoured with the older novelist. After the departure of the couple from Pjotr’s home, everything spirals into a pool of despair and unrequited love. The Seagull proves that classic theatre does not always translate well to the modern cinema. Despite a stellar cast and an attempt to remain faithful to the original script, this translation of the Russian stage production struggles to catch the imagination of this era. Crossing the cultural divide of how humor and drama are defined between the land of Tolstoy and Putin to modern western sensibilities suffers from overreach with this production. Not that Mayer does not do his best to capitalize on his cast and their abilities to interpret the characters. Annette Benning and Elisabeth Moss manage to capture the tragic over the top antics of women travelling through different seasons of life and how some try to hide their sufferings better than others. Corey Stoll does his best to play the smoldering cad, but it is the young cast members who steal the show. 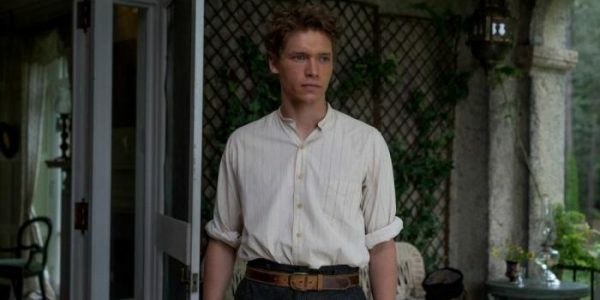 On Chesil Beach alumni, Saoirse Ronan and Billy Howle, manage to embody the innocence of youth and the catastrophic nature of the stages of ageing. Even with these potent and committed performances, the barrier of cultural interpretation is where things fall apart. With the tale occurring in the Russian countryside, having the full cast maintaining American accents makes this an arduous journey to accept. Especially while trying to convey the dry and dank comedic overtones, there is very little to enjoy in the end. Reminiscent of trying to tell a joke during open heart surgery, this is a stage production that may be best left in the theatre or in the past.